02:00:00 Makes 21 servings, 2 cookie balls (43 g) each. Makes 21 servings, 2 cookie balls (43 g) each. We love chocolate cookie balls. But what happens when you add a dash of mint to the mix? 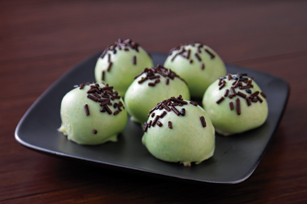 You get a batch of mint-chocolate cookie balls that taste like decadent chocolate truffles. Mix cream cheese, 1/2 tsp. extract and cookie crumbs until well blended. Shape into 42 (1-inch) balls. Refrigerate 30 min. Melt chocolate as directed on package. Stir in food colouring and remaining extract. Dip balls in chocolate; place on parchment- or waxed paper-covered baking sheet. Top with sprinkles. To easily coat cookie balls with melted chocolate, add cookie balls, in batches, to bowl of melted chocolate. Then, use 2 forks to roll cookie balls in chocolate until evenly coated. Remove cookie balls with forks, letting excess chocolate drip back into bowl before placing balls on prepared baking sheet. Place completely unwrapped package of cream cheese in microwaveable bowl. Microwave on HIGH 15 seconds or just until softened. Add 15 seconds for each additional package of cream cheese. You will need 1-1/3 pkg. (300 g each) Oreo Cookies to get the 36 cookies needed to prepare this recipe. Enjoy a serving of these rich and indulgent cookie balls on special occasions. Serving Size Makes 21 servings, 2 cookie balls (43 g) each.